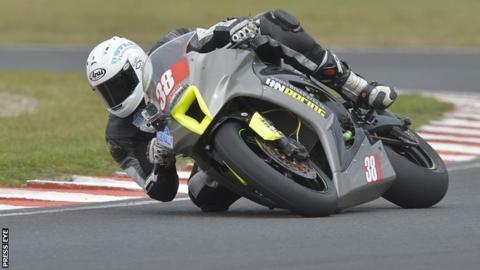 Cody Nally secured a hat-trick of wins at the opening round of the Adelaide Masters series at Mondello Park. The Athlone rider edged out Portadown man Marshall Neill in the big-money Grand Final event, with Dubliner Derek Sheils in third place. Nally also won two of the Superbike outings, with CD Racing Kawasaki man Sheils taking victory in the other, beating Nally by two seconds. Sheils, Robert English and David Haire enjoyed Supersport 600cc successes. Nally had started the season well by winning three of the first four Irish Superbike races and maintained his form with a treble at the County Kildare circuit over the weekend. He won Superbike race one by seven seconds from Manxman Dan Kneen, with Sheils completing the podium positions. The second race saw Shiels come home ahead of Nally, with Waterford's Brian McCormack third. Nally won the third 'big bike' joust by 0.7 seconds from Sheils, with Mark Glasgow third on that occasion. Sheils's fine form continued in the Supersport class, as he won the weekend's opening race in that category, ahead of Luke Johnston and Carl Phillips. English won a thrilling second race by just 0.06 seconds from Richard Glasgow, with Aidan McLean making the rostrum. Lisburn's David Haire claimed a slice of the glory by taking race three from Phillips and Jason Lynn. The next round of the championship will be held at Mondello Park on 14 and 15 June.